Little Free Libraries is an international organization that, in its most basic definition, provides a "box full of books" for people to take home and read. These boxes of books are located in neighborhoods, shopping centers, parks and many other locations around the world. Each Little Free Library is a small house/library-like structure placed in a public place that houses books that people can take home and read at no charge. The concept is "Take a book, leave a book". Each Little Free Library has a volunteer steward who monitors it, making sure it is stocked with books and that the materials are appropriate. Anyone can put a book in a Little Free Library and anyone can take a book from a Little Free Library. Click here to learn more about Fort Dodge's Little Free Libraries and see the list of locations. 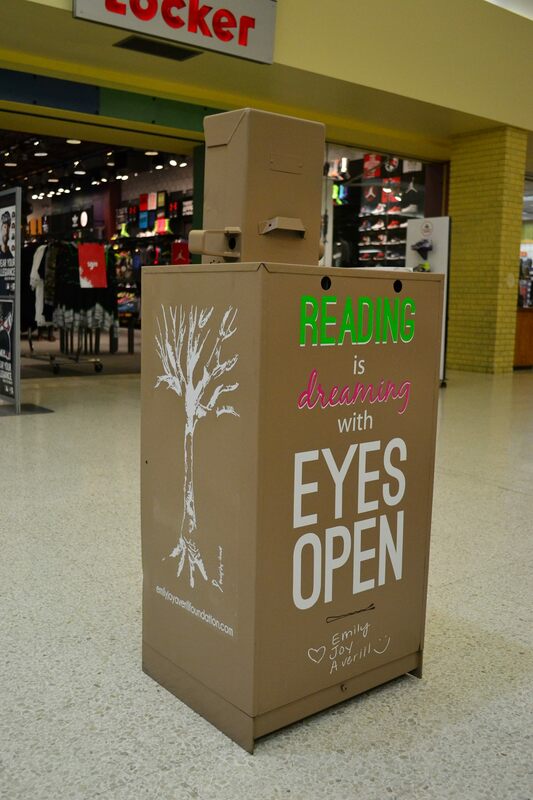 This Little Free Library, located inside of Crossroads Mall, was built in memory of Emily Joy Averill. How does this library work? The Little Free Library offers a way to share good things to read – favorite books from your childhood or books you would recommend to friends; books that teach, intrigue and engage you. All of us can help by keeping these collections stocked with good reading material – just put the books you would like to contribute into a Little Free Library – perhaps you would like to write your name so that the next person who reads the book knows where it came from. This idea was brought to the United Way of Greater Fort Dodge by Kim Helmick, Nancy Hamilton and Lisa Johnson. Kim had visited some other communities that had Little Free Libraries in neighborhoods and thought it would be a great idea to have some in Fort Dodge. The United Way of Greater Fort Dodge is a strong advocate for promoting literacy and reading. After all, a child learns to read up to age 10; from age 10 on forward, the child reads in order to learn. We must ensure that every person in our community has the opportunity to become a proficient reader. Little Free Libraries are fun and simple ways to provide access to books for people of all ages. We partner with the Fort Dodge Public Library, the Joy of Reading program and local schools to promote literacy. These libraries belong to everyone – neighbors, friends and people we don't even know yet. Anyone can use them. If you see something you would like to read, just take the book home and read it. You can keep the book if you'd like, you can return it or maybe even donate some of your own books to the Little Free Library. It's that simple. There are a number of ways community members can get involved with the Little Free Libraries project beyond using them and encouraging others to use them. People can contribute books they no longer need so that the Little Free Libraries can be continually restocked. Donated books can be dropped off at the United Way of Greater Fort Dodge office, 24 N 9th St, in Fort Dodge. If you are interested in building and/or becoming a steward for a new Little Free Library, please contact Amy Kersten Bruno at 515.573.3180 or amy@fd-foundation.org. The idea of Little Free Libraries began in Wisconsin in 2009. Todd Bol, of Hudson Wisconsin, built a model of a one room schoolhouse in honor of his mother who was a former teacher. He used recycled materials to build it, filled it with books and put a sign on it that said "Free books". His friends and neighbors loved the idea, so he built a few more. He was also inspired by Andrew Carnegie, who built libraries in communities across the United States and around the world. He understood the critical importance of literacy and providing the means for all people to be able to read and acquire knowledge. The first library he commissioned was in his birthplace in Scotland. The motto "Let there be light" was carved at the entrance. Mr. Bol and his friends were also inspired by Miss Lutie Stearns, a librarian in Wisconsin who brought books to over 1,400 locations with her travelling libraries in the late 1800s and early 1900s.